Marasi Al Bahrain ... an artist’s impression. 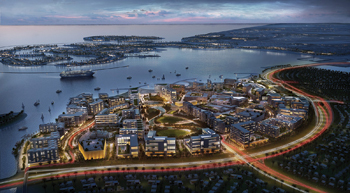 SIGNIFICANT developments have taken place at Diyar Al Muharraq over the past year, with Bahrain’s newest upcoming master-planned city having marked a number of milestones over the past month alone. Taking shape off the northern shores of Muharraq island, Diyar Al Muharraq marked the completion of land reclamation works on the entire development and recently signed key deals with other real estate developers to build key features of the city. Encompassing a range of housing options and quality lifestyle, Diyar Al Muharraq offers a cohesive mix of residential and commercial properties and amenities such as over 40 km of waterfront, together with sandy beaches as well as all the elements one would expect in a vibrant community, including schools, medical centres, parklands, sports facilities, and a wide selection of retail services. Following the completion of land reclamation works, the shore protection rock armour work is nearing the final stages and expected to be finished by the first quarter of 2015. The contract for reclamation and shore protection services was awarded to Great Lakes Nass, a joint venture of Great Lakes Dredge and Dock Company (Great Lakes) and Bahraini company AA Nass Contracting. Work started in November 2006 and was achieved well on schedule. Following the completion of land reclamation works, Great Lakes Nass hired the world’s largest submersible barge (300 m long by 90 m wide) to ship its dredgers and other equipment to carry out work on the Suez Canal in Egypt. FROM LEFT: Dr Maher, Alabbar and Al Khayyat. 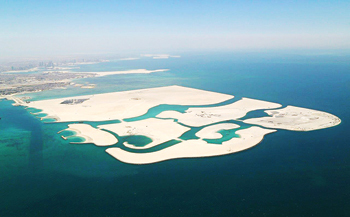 Commenting on the successful completion of the land reclamation, Dr Maher Al Shaer, CEO Diyar Al Muharraq, says: “This is a milestone for Diyar Al Muharraq as years of effort and perseverance have brought us to this point wherein a vital and enormous part of the project has been completed well within the stipulated time. Dr Maher says that with the completion of all land reclamation works, the focus will now be shifted to the construction of primary infrastructure and the construction of building projects. “From here on, we can look forward to a fast approaching future, one in which we implement our progressive vision of providing solutions that combine high-end technology and innovative designs with the highest of standards to cater to the needs of the people,” he says. Great Lakes Nass combines the land reclamation expertise of Great Lakes with the proven capability of the Nass Group in carrying out rock protection works. The land reclamation work on Diyar Al Muharraq is the company’s latest venture together after its success in reclaiming the Khalifa bin Salman Port, the Industrial Area in Hidd, and the resort project of Durrat Al Bahrain. Meanwhile, the eastern shore of this new masterdevelopment will house a one-of-its-kind destination in the kingdom following a joint venture agreement between Diyar Al Muharraq and Eagle Hills Abu Dhabi. The concept design works for the project, known as Marasi Al Bahrain, have already begun. Occupying a total land area of 864,484 sq m, the development will include luxury hotels and restaurants, high-end residential apartment buildings, business, leisure and entertainment centres, and a harbour for cruise liners and ships with fully integrated facilities. Diyar Al Muharraq ... an overview of land reclaimed. Marasi Al Bahrain is a pioneering leisure offering with respect to the magnitude and the range of experiences offered. The project will have a total built-up area of approximately 1.25 million sq m and will include 1,980 m of beaches around the city, and a central garden spanning 93,000 sq m. The project will also feature a traditional suq and a business centre on 80,000 sq m that will be a new concept blending business and technology. Another major tourist attraction will be a shopping, leisure and entertainment centre; and a mall with a built-up area of over 190,000 sq m, offering a unique experience along the beachfront. On the residential front, Marasi Al Bahrain will offer inhabitants and tourists luxury hotels, with over 800 luxury rooms, and restaurants that overlook the waterfront and high-end apartment buildings. The residential buildings will rise to a height of up to 45 m and will have a total of 3,500 apartments overlooking clear blue waters. A landmark development within the project is Dragon City, which is situated on an area of 115,000 sq m to the south-west corner of the city. With work well under way on the focal feature, which is the Dragon Mall, Diyar Al Muharraq has signed another major deal with Bin Faqeeh Real Estate Development Company for the development of Dragon Apartments, a major residential complex covering an area of 20,000 sq m close to the mall. Diyar Al Muharraq and Bin Faqeeh officials shake hands on the Dragon Apartments agreement. The project will comprise five multi-storey residential buildings of four and six storeys with a total of 300 apartments. Construction work on the apartments has already begun and is due to be ready by June 2015 to coincide with the completion of the Dragon Mall. This is the first time that Diyar Al Muharraq is collaborating with Bin Faqeeh, heralding the start of a major corporate alliance. Dragon City is uniquely infused with Chinese architectural and cultural aspects and incorporates 780 shops with an area of 4,500 sq m designated for warehousing. The landmark project also includes a 6,000-sq-m dining street and car parking for 1,500 vehicles. With the foundations of both the mall and the dining street already laid, the completion of all works is due by mid-2015, around the same time that the residential complex is to be completed.